The Temescal Branch Library is is one of sixteen libraries in the Oakland Public Library system. 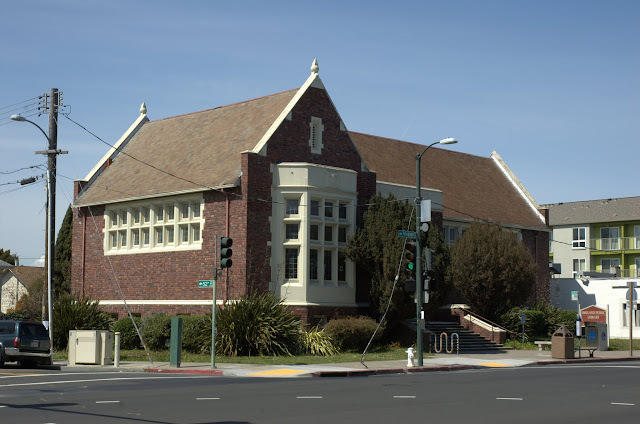 The branch was originally named the Alden Branch of the Oakland Free Library. (Solomon E. Alden was a settler in the area in 1855; the name Temescal didn't come into common use until later.) The building was designed by Charles W. Dickey and John J. Donovan in the Tudor Revival style, built in 1918 by R.W.Littlefield, and is on the National Register of Historic Places, #96000105. This branch, along with three others, were designated as an Oakland Landmark on November 4, 1980. It is one of six Carnegie libraries in Oakland. The branch was first located on 4801 Telegraph in 1899 and moved several times along Telegraph Avenue, 4751, 5132, 4906. From 1997 to 1999 the branch moved to a temporary location on 4920 Telegraph for seismic retrofitting. The branch is also home to the Tool Lending Library. The branch is equipped with five computers with internet access and word processing. There is one express terminal with 20-minute turns, and sign-ups are on a drop in basis. For the other 4 computers, people can reserve hour turns on the library catalog. Lawyers in the Library: 1st Tuesday, 6:00-8:00 PM. Lottery sign-up at 5:45 PM. Toddler Storytime: Wednesdays and Thursdays, 10:30 AM.